We hear in the news every day about threats to peace coming from North Korea. Kim Jong Un seems determined to complete his plan to build an arsenal of nuclear-armed ICBMs that can threaten the United States. The U.S. is just as determined to prevent Kim from obtaining that capability. Diplomacy is being pursued, and we cannot rule out regime change or the untimely death of Kim. But, absent that, war between the U.S. and North Korea seems inevitable before the end of March 2018; (that’s the deadline Mike Pompeo, Director of the CIA, told me at a private meeting in Washington DC last week, hosted by a think tank where I am a board member). But, North Korea is not the only clear and present danger to peace. This article shows that the situation is not stable in the South China Sea either. 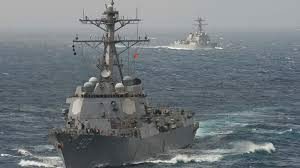 Confrontations between the U.S. and China are occurring routinely around islands that China claims in the South China Sea. The U.S. regards these Chinese claims as excessive and has conducted maneuvers in order to assert freedom of navigation around the islands. Neither China nor the U.S. wants a war over these islands especially at a time when both parties are trying to cooperate to contain the North Korean threat. But sometimes wars happen not because the two sides want a war but because of accidents and miscalculations about the intentions and capabilities of the other side. Such an accidental shooting incident or collision cannot be ruled out. Escalation from there is a genuine danger. It would be ironic if — with all of the attention being paid today to North Korea — the actual spark that set off a war happened thousands of miles away in the South China Sea.